Maintaining strong relationships with customers is no cakewalk. Not everyone can do it and if you do it right, it can set you apart from your competitors and help you set a foot in the market. The act of maintaining strong customer relationships is crucial for any business. By being loyal to your customers, you give them valid reasons to come back to you and spread the word about your services. 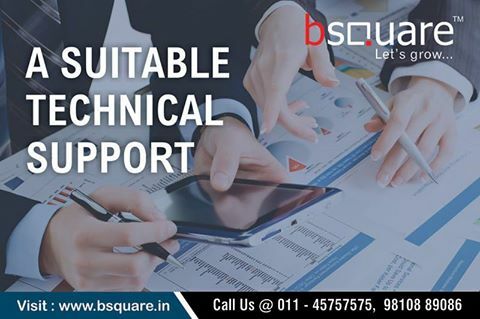 Bsquare, a leading software services company offers Customer Relationship Management (CRM) software solutions in India. CRM acts as the connecting link between your organization and your customers. Cloud CRM Software is a comprehensive solution that helps an organization in development by compiling and maintaining the data of the customers most efficiently while capturing all pre-sale and post-sale force interactions of the customer. The information is compiled across different channels or points of contact between the customer and the company. The points of contact could include the company's website, telephone, live chat, direct mail, marketing materials and social media. Through CRM companies can manage and analyze customer interactions and data throughout the customer lifecycle, with the goal of improving business relationships with customers, assisting in customer retention and driving sales growth. CRM systems can also offer customer-facing staff detailed information on customers' personal information, purchase history, buying preferences and concerns. Bsquare’s INTACT CRM Software solutions comprises of a comprehensive functionality that caters to all enterprise requirements for retaining customer support and loyalty, leveraging on the capabilities such as Sales Force Automation, Contact Center Management, Campaign Management, Service Support Management, AMC Management, Asset Management, Work Shop Management, Loyalty Program, IT Infrastructure and information assets. With Bsquare as your service provider, CRM wouldn’t seem rocket science to you and your company. By keeping your customers at the heart of your business, you can effortlessly strengthen your bond with your customers and drive your company towards growth!